Commercial real estate availabilities are always changing as retail tenants and property leasing managers are in a constant influx of tenant identification, site selection, expansion to new locations, and updating their real estate portfolios. PiinPoint's Real Estate feature will be replaced in the coming weeks by the opportunity to get involved in Sitematch. 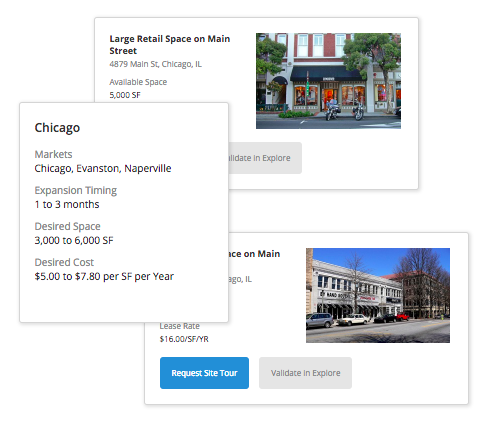 Sitematch connects growing retailers with brokers and landlords who have suitable real estate listings or vacancies. The result? Curated listings for retailers, and faster deals for brokers. Rather than showing retailers the full gamut of vacancies available, Sitematch connects them with the broker or landlord who has their ideal site criteria in their strategic markets. This is specific to unique site requirements like square footage, parking availability, signage, leasing costs, and more. CRE pros get a weekly report on retailers who are moving in the market who could use their services. Rather than constantly marketing properties and dedicating countless hours to targeting potential tenants, Sitematch helps brokers get opportunities in front of the right retailers. Get involved in Sitematch early! Click below to get more information on how you can be a part of the beta program.